Last Tuesday, Apple introduced the sixth-generation iPad. With prices starting at $329 ($299 for schools), the tablet also supports the Apple Pencil, and is powered by 2016's A10 Fusion chipset. If you're interested in purchasing one, you might be able to pop into your local Apple Store and walk out with the tablet in hand. 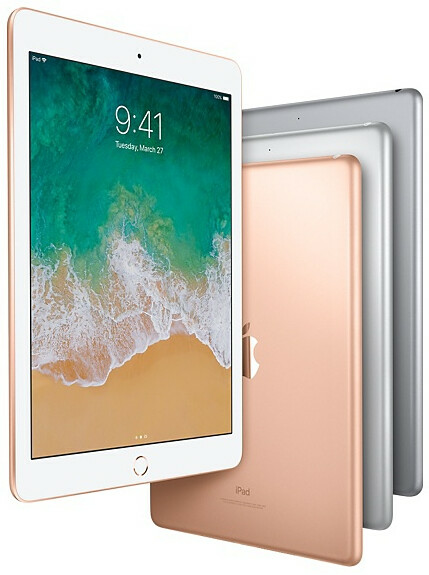 Starting yesterday, the sixth-generation Apple iPad was in stock at most of Apple's retail stores in the U.S. The sixth-generation Apple iPad is available with 32GB or 128GB of storage. It also is offered with WiFi only, or with WiFi + Cellular connectivity. Color options are Space Gray, Silver and Gold. The Apple Pencil is optional and will run you $99 ($89 for schools). Apple started accepting pre-orders last Tuesday when it unveiled the device. Deliveries of those orders were due to arrive starting yesterday. But if you didn't place an order, you can go to Apple's on-line store and start picking the color, memory and connectivity options you want for your new 9.7-inch iPad. You will then be able to click on "check availability." 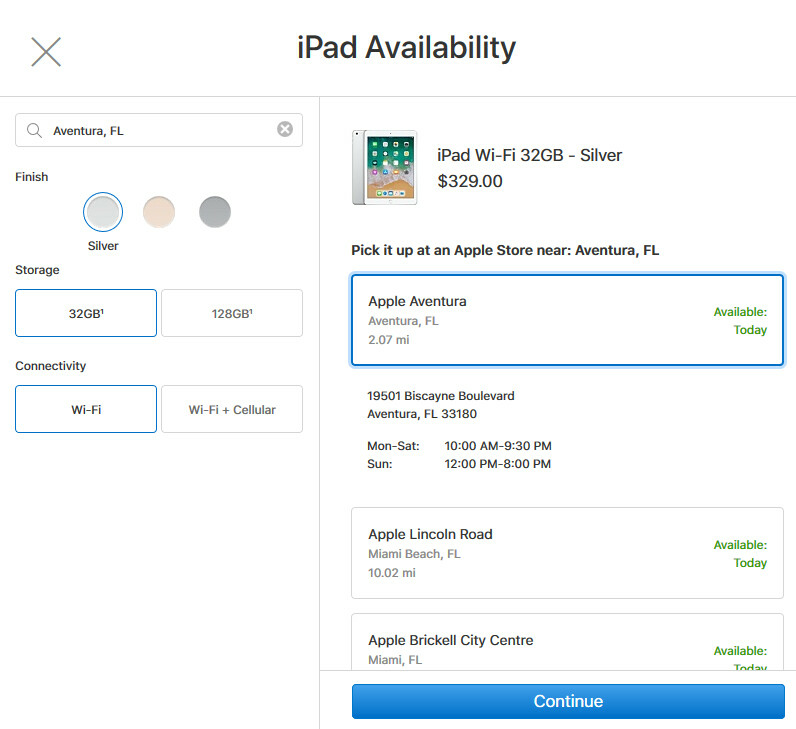 Type in a city or zip code, and you will be able to see if the sixth-generation iPad, the way you want it configured, is in stock at a nearby Apple Store. If it is in stock, instead of waiting for it to be shipped to you, the tablet can quickly be in your hands. I can open 300+ Desktops on my Windows 10 Hybrid and multitask like a champ. I can edit videos, photoshop images, make stunning presentations, complex Excel spreadsheets, play GTV IV, download torrents, run pirated softwares, emulate or dual boot Android, Ubuntu, Chrome OS, DOS Box etc, run a bloody server, stash a TON of data thanks to a relatively huge 500GB SSD, make softwares in practically all languages for almost all platforms and the list goes on. And on. And on... And... Well, you get the idea! Oh well, G'Day! The iPad made me understand that windows pcs are overkill. Enjoy your 300+ desktops. I enjoy reading the news on a beach café. It is sad that some people couldn't get your obvious sarcasm smh. Pfft... That green guy on Post #1 is such a troll, eh? Do we really need all that processing power and flexibility of a full desktop OS the entire time? 'Normal' people don't care about any of that. All they use is Facebook, Instagram, Netflix, iTunes and Snapchat and all they need is a small, portable and relatively simple device with great cameras and battery life. When was the last time you saw a laptop whose camera could hold its own against an iPad's camera? And I'm sure that laptop of yours with "300+ desktops" won't last two hours while surfing the internet without the keyboard housing that usually holds an extra battery! And besides, iOS 11 for tablets can multi-task in real time like a "champ" too! iPad is in a league of its own and nothing from The Windows and Android world can come close to it. Oh well, G'Day! Did you forget to log in to your other account or something? You talk about post #1 greenman...you are greenman. There are two sides of an argument. I thought people would get it. But instead, they are curious if I'm on drugs! I think its true when they say that IQ levels are dropping with each generation! Sad! G'Day! i want to meet u in person..u seem like an interesting person. Can't wait to get one of these with the pencil! Nothing to make me give up my 12.9 Pro. Its such an awesome tablet. What exactly is the difference between a regular Apple chip and a chip with an "X" after it? As a matter of fact, what's the difference between this iPad and the iPad Pro 9.7 anyway? The pro 9.7 had some value added features. This thing is rehashed spare parts thrown together in the most disconnected push into education in history.